Director Geoff O’Keefe reunites with actor Neill Fleming, following his memorable Claudius in the Mill’s 2016 Hamlet, for an eerie take on Shakespeare’s Scottish play. 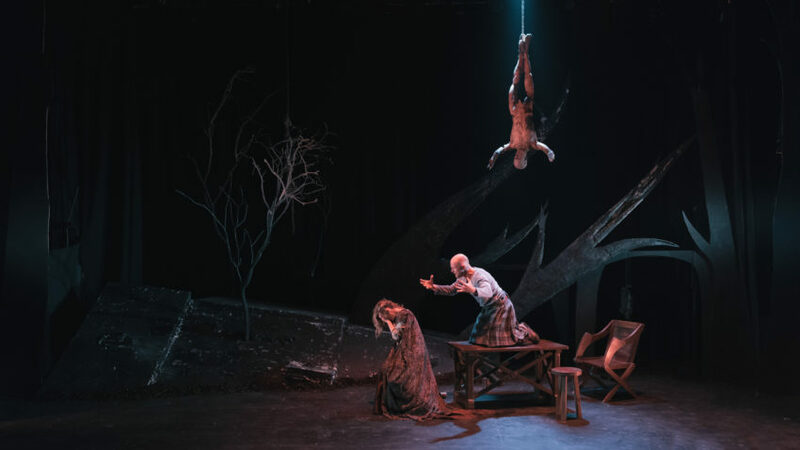 Gerard Bourke’s set and Kris Mooney’s lighting design create a powerfully eerie atmosphere. A skeleton and a decaying body hang over the stage emphasising the brutal nature of this Dark Ages kingdom, while Olga Criado Monleon’s costume design of flowing robes with all-encompassing hoods for the witches unsex them, allowing a terrific initial jolt when they seem to exit on one side and immediately appear on the other by magic, and also continually allowing them to prowl in the shadows of a stage replete with nooks and crannies. Their constant surveillance of the action makes them appear like irresponsible Greek gods toying their chosen mortals, and allows a terrific interval when they close the curtains with some theatrical magic. If Michael Fassbender’s cinematic interpretation seemed to focus on the line ‘Full of scorpions is my mind’, Fleming’s turn here seemed to pivot on his agonised complaint to Lady M, ‘I have filed my mind’. MacEvilly’s Lady Macbeth is wonderfully contemptuous of Macbeth’s weakness during the feast, and in her sleepwalking seems less to be plagued by guilt as to be reciting both sides of her fight with Macbeth for his blundering with the knives. But despite the darkness O’Keefe finds some unexpected comedy in the text. Devaney’s Porter is played as still reeking of drink, and Macbeth arrives as if after carousing, concluding the recitations of ominous portents with a tart ‘It was a rough night’. There is also a delirious moment where Macbeth wheels around during the feast to check if Banquo is still there precisely when Banquo has melted away temporarily, the better to appal him later. Playing Shakespeare with a cast of nine requires much doubling, and bar the predictably Lynchian moment when Devaney’s Porter appears right after the murder of Devaney’s Duncan, it works very well. Ailbhe Cowley very effectively switches between Lady Ross and Lady Macbeth’s servant with quick changes of hair, costume, and accent, while Kenny makes his doctor unrecognisable from his Banquo. Jed Murray’s imposing Macduff is a gruffer character than we’re used to, and his sword-fight with Macbeth ends with a piece of derring-do that wouldn’t be out of place in a Hollywood swashbuckler. The gruesome coup de grace may not work for all, but this is a fast-moving production of much dark magic. Macbeth continues its run at the Mill Theatre until the 26th of October. The Mill Theatre returns to the Shakespearean well in autumn once again with a spirited production of Shakespeare’s bleakest tragedy. 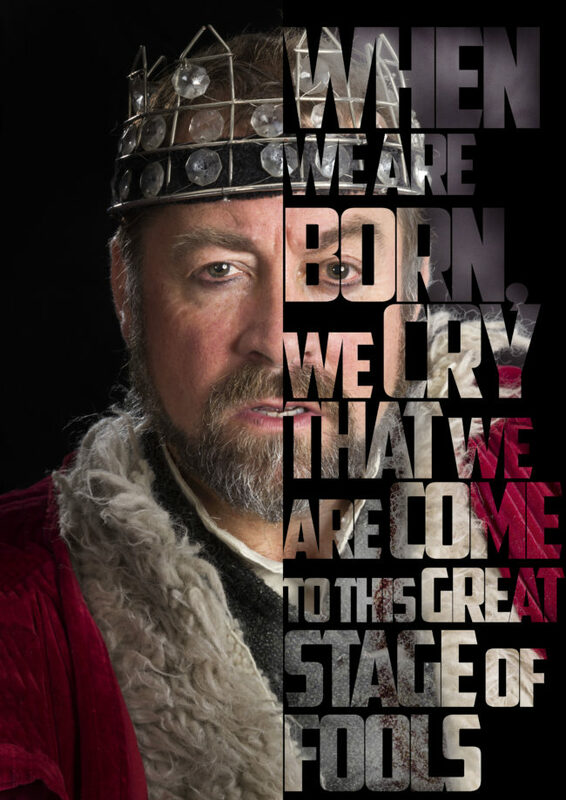 There is a certain Game of Thrones vibe to this production, from Kent’s ‘disguise’ being a Yorkshire swagger, through the furry ruff of Lear’s greatcoat, to the stylised throne amidst three massive complicated spikes making a crown that dominates Gerard Bourke’s set design. This delivers an unexpected visual payoff when near the finale the villainous Edmund sits on the throne to lean on his sword; so close to possessing absolute power… Comparisons to Selina Cartmell’s 2013 Abbey production are inevitable as that trafficked in medieval visuals, but this production is considerably less expansive; no galleries and wolfhounds here. Director Geoff O’Keefe, however, avoids the muddled paganism Cartmell attempted. But, in a play already replete with disguises, he has doubled a number of parts; most startlingly Cordelia and the Fool being the same actress. That bold choice pays off, as do most of the doublings, though there is one silly wig. O’Keefe doesn’t quite achieve anything as revelatory as Neill Fleming’s Claudius in last year’s Hamlet, but he adds interesting notes to multiple characters. The Fool is the apex of an uncommon commitment to the bawdiness of the play, and when CMD returns as Cordelia she holds a sword almost as a signal that she has been hardened by her exile; which makes her reunion with the mad Lear, when he finally recognises her, all the more tear-jerking. McCoy’s Goneril is more nuanced than the pantomime villain oft presented, her glances at Regan and Cordelia in the opening scene suggest a panicked resort to flattery and encouragement to her sisters to do likewise to humour a mad old man. O’Keefe perhaps overeggs her late asides to the audience being spot-lit, but McCoy grows into villainy impressively; aided by O’Connell’s novel rendering of Regan as daffy malice, and McKernan bringing out the black comedy of their love triangle as an Edmund cut from Richard III’s gloating cloth. Judge is a notably conversational Lear in his ‘fast intent’ speech; his decision already made there is no need for pomp or majesty. This is a king in flight from majesty. Whereas previous Lears that I have seen, Owen Roe and Gerard Adlum, favoured camp notes for their madness, Judge’s Lear is childish; running, hiding behind benches, playing games with imaginary friends. His retreat from responsibility while wishing to still enjoy kingship is after all a retreat to childishness, and his shocking spit on Goneril is of a part with the spite of children. The madness on the heath is wonderfully achieved with Kris Mooney’s blue lights raking the audience while Declan Brennan’s sound effects swirl queasily. Judge’s descent into second childhood is expressed through sudden rage that almost outstrips language, perhaps the impulse for the sound design of screeching animals between scenes. In support Tom Ronayne is wonderful comic relief as a put upon servant, fussing over benches and defending himself with a cloth. This is a fine production that has a number of interesting interpretations, and succeeds in pulling off the extreme ending which still remains the ultimate kick in the guts. King Lear continues its run at the Mill Theatre until the 28th of October. Tom McEnery, former mayor of San Jose, turns playwright with a whimsical take on the locals of Ballybunion attempting to crash the news-cycle in 1998. Jackie Costello (John Olohan) is trying to put some hope back into Ballybunion, but the other members of the local civic Committee aren’t much help. John Joe (Frank O’Sullivan) wants a statue of the O’Rahilly, Shamie (Enda Kilroy) doesn’t care, Hannah (Joan Sheehy) is preoccupied waiting for a mystical island to rise, and local politician Austin (Damien Devaney) is more concerned with the cost of preserving the local ruined castle than with the prestige of preserving it. Local enigma Ted provides a solution, which, with the help of visiting emigrant Jimmy (Mark Fitzgerald), might be a real boost for Ballybunion. Dedicate a statue to Bill Clinton to lure the President into town for a game of golf beside Costello’s pub while visiting to celebrate the Good Friday Agreement’s adoption. The only objections come from Kathy (Liz Fitzgibbon), Jackie’s cynical daughter. Watching A Statue for Bill Clinton is a disconcerting experience. Everything feels made for export: Irish characters in Ireland, as written by an American for Americans. Much quoting of Wilde, Shaw, Heaney amid analyses of Ireland, while can-do American spirit provides the answer to all ills. Not that how hoping that getting POTUS to do a photo-op will magically rejuvenate the town’s economy is ever interrogated as dubious ‘self-help’. The pub setting, returning emigrants, and dreams of success and idealism recall Conversations on a Homecoming and Kings of the Kilburn High Road. Which is unfortunate as it clearly does not aspire to their depth. But then despite billing itself as a true Irish comedy, it doesn’t attack the comedic jugular either. Instead Jackie speechifies hopefully and Kathy speechifies cynically on the motion of the superstitious backwardness of dear old Ireland. Things pick up in the second half as the characters wince their way thru radio reports on the deepening Lewinsky scandal, and shenanigans abound with dodgy sculptors and mischievous local rivals. You wish that McEnery had either concentrated on this material from the beginning, or done another draft to trim some of the thematic posturing and deepen the characters. At times it feels like he’s 80% towards a successful script, if only he would make the economic homilies a little less on the nose, the relationship between Jimmy and Kathy a little less of a homage to that Irish theatrical trope from John Bull’s Other Island to Translations of the instant romance between the Irish girl and the arriving foreigner, and stop making 1998 quite so anachronistic: pretending the Church is all-powerful, while also anticipating the demise of the Tiger. A Statue for Bill Clinton is enjoyable, but it’s not quite a comedy and it’s not quite a proper drama either. A Statue for Bill Clinton continues its run at Belvedere College until the 13th of August.